Use tiled InkWelle Scenery Screens along the border of your land to block the view of your neighbor's property. Includes sets of three panels: left, center, and right. The screens are modifiable but not copyable or transferable. Covered with images of cedar trees, the prims used to create the center panels in this screen are "mega prims" that are 10 meters high by 20 meters wide. This enables you to create a longer screen with fewer prims. Set includes 10 Center panels (10 meters high by 20 meters wide) and 16 End panels (10 meters high by 2.5 meters wide). You can build up to 8 short screens or a single screen that is 205 meters long with this set! Uses photos of trees (all three panels shown). Set includes 16 Center panels (1 prim each, 8 m wide x 7 m high) and 12 End panels (1 prim each, 2 m wide x 7 m high) All panels can be resized up to 10 meters high. You can build up to 6 short screens or a single screen that is 130 meters long with this set. 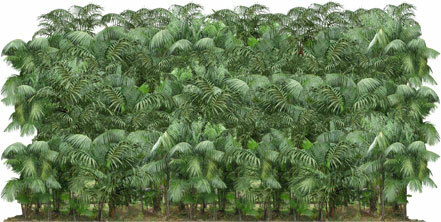 In addition to being a great tropical privacy screen, use this as a "room divider" in the Jungle Skybox. Set includes 14 Center panels (1 prim each) and 12 End panels (1 prim each). All panels are 10 meters wide x 9.4 meters high, and can be resized up to 10 meters high. You can build up to 6 short screens or a single screen that is 150 meters long with this set. This screen uses the original Palm Screen photos but "tiers" them three levels high, resulting in a screen that is 20 meters high! The set includes 12 Center panels (1 prim each) and 8 End panels (1 prim each). All panels are 20 meters wide x 20 meters high. Because it is built with "MegaPrims" this cannot be resized. You can build up to 4 short screens or a single screen that is 280 meters long with this set.